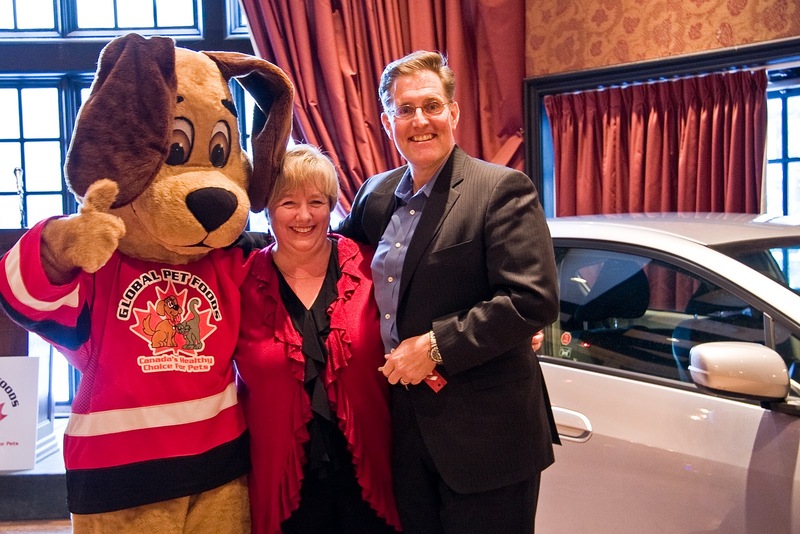 Toronto Dogs Directory: Global Pet Foods Unveils Two New Mascots, And Presents New Cars To Two Very Lucky Individuals! 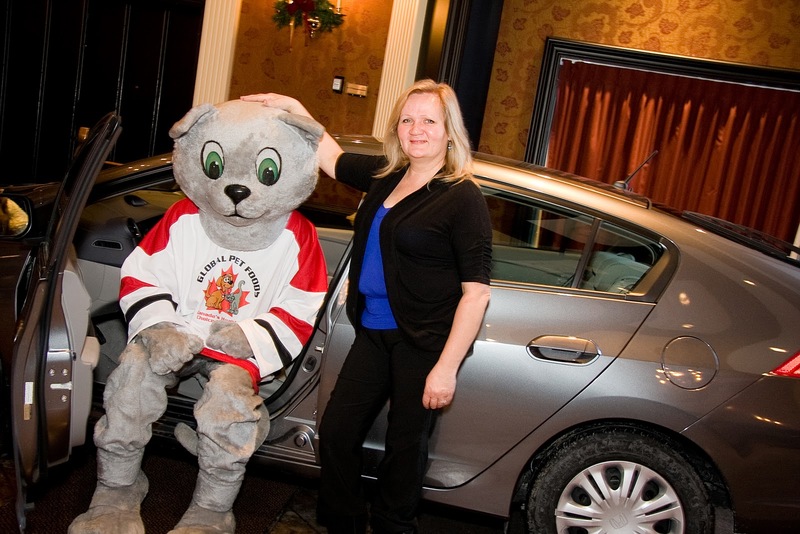 Global Pet Foods Unveils Two New Mascots, And Presents New Cars To Two Very Lucky Individuals! Hamilton and Burlington Pet Parents land brand new cars in the Ultimate Name Dropping Contest. Toronto, ON --On October 4, 2010, Global Pet Foods began a search to find names for their dog and cat mascot and turned to Canadian pet parents for help in their Ultimate Name Dropping Facebook Contest From Oct. 4 to Nov. 1, pet parents across Canada were invited to drop their pet’s name, story and photo in the Global Pet Foods’ Facebook contest for a chance to win 1 of 2 brand new Honda Insight Hybrids. And two lucky runners- up won free pet food for a year. Global Pet Foods fans and friends helped determine the winners by voting for their favourite dog and cat names on Facebook. Global then selected the ultimate winners from the top 10 dog and cat names with the most votes. The top 10 dog and cat finalists were asked to write a short essay about their pet’s story and why their name would be a perfect fit for Global’s mascots. Pam Hrycyk from Burlington was a grand prize winner and won the grand prize Honda Insight Hybrid for her dog’s name Grizz. Hamilton pet parent Christina La Plante also won a brand new Honda Insight Hybrid for her cat’s name Peanut. “It was a voting contest and I spent all month begging my Facebook friends for help”, explained Hrycyk . “I'm lucky that so many of them have watched Grizz grow up over the past 5 years and they love her too so they were willing to help by voting every day. At the end of the first month we went into the next round in 10th place. When I got the call from Global's president saying they chose Grizz as the winner I was stunned. This was quickly followed by excitement and giddiness!! I'm really looking forward to having a "green" car.” Pam chose Alabaster Silver as the colour for her car and will be driving the car home later this week. Five years ago a raspy squeak came from around the corner of a barn, belonging to the most adorable orange and white kitten that had been abandoned by his mother and could no longer meow. After hearing him meow for two days, I lured him in with food because he was starving and then I took him home. My daughters immediately fell in love with him and joked about naming him “Peanut” because he was so tiny from being starved, but had a very large head. The name Peanut stuck. My handicapped daughter enjoys Peanut riding around the house on the foot rest of her wheelchair, where he believes is his rightful place on her chair. As Peanut grew, so did his appetite. He went from a tiny starving kitten to a solid muscular tomcat. He eats healthy portions of food three times daily, but is very well-mannered about it. We taught Peanut to sit and “says please” like a dog for his food, which he does without us asking just to tell us that he is hungry. Strangely enough, he even plays fetch like a dog! Peanut would be an amazing mascot because he is a gentle, friendly cat that gets along with all people and all animals. He even made friends with the neighborhood skunk! The Global Pet Foods brand is all about healthy cats and dogs that are active and friendly which is how we raised Peanut – the most lovable cat you could ever have. Global Pet Foods is Canada's largest chain of pet food stores specializing in natural, holistic and organic foods and supplements, with 130 stores across Canada.